A week and a half ago, a package arrived on my doorstep. Checked the sender. Cryptic? Yes. So to whoever it was who chose to indulge my childish whim, now's the time to say so. How else will I be able to tell you what I think and explain my mathematical prowess? We went to Hepburn Springs to taste the spring water. Best way to describe it is to say that it's like sucking on a rusty iron tap - awful!! Left a bad taste in my mouth for half an hour. Spring had clearly sprung and it was lovely. Particularly liked the Californian redwood (top right) - it towered over the other trees. 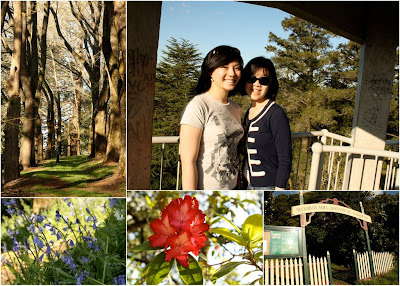 Headed to the Wombat Hill Botanical Gardens and climbed to the top of the lookout tower. See me and my friend there? We were both extremely queasy at that point in time. Does it show? So I have a confession - I love listening to Taylor Swift. I don't actually get sick of any of her songs. Especially You Belong With Me. Now that she has released a few more tracks with her Platinum Edition album, I've been listening to her new songs. Yes - all her songs are all about the same thing - being a girl that is unseen, secretly crushing on someone out there. Isn't there a girl like that in every one of us? 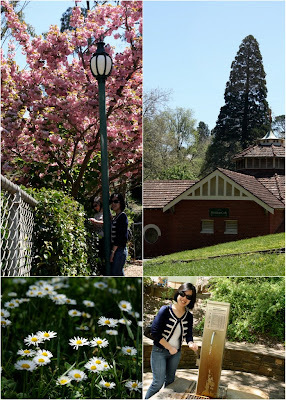 A whole post dedicated to the places we went to in Daylesford. In all, a very satisfactory dining experience. Boathouse - The restaurant is right at the lake's edge. Made me feel like maybe a lakehouse is better than a beach house. Still thinking about it. 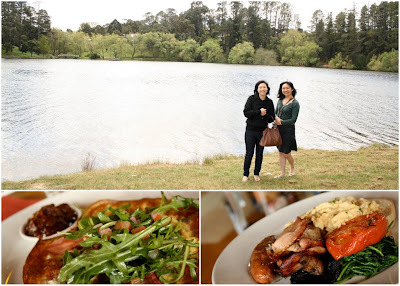 Lakehouse - Supposedly the best dining experience in regional Victoria, I guess it didn't disappoint. 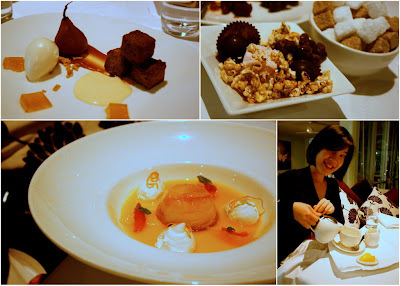 A 3 course meal ended up feeling more like 10 courses or so because of the pre-entre, pre-dessert, post-dessert and the main course that had 3 separate elements that ended up feeling like 3 separate courses. Very very filling. Pictures did not do it justice - the lighting was just too dim. That's me enjoying my post-dessert tea. I'm still unsure if drinking tea at night causes sleeplessness. I couldn't sleep after it, but it could have been due to overstimulation over the day. Who's to say? Frangos Frangos - Love their huge flower arrangement of huge lilies. 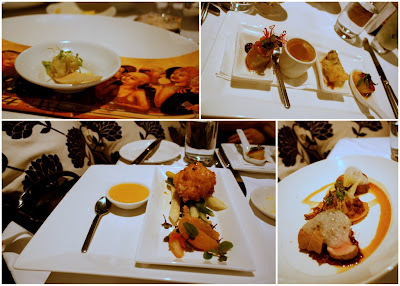 Food was good too - trying to think of what I had but to be honest, it's starting to slip out of my mind. As I said, overstimulation - too many things happening at the same time. 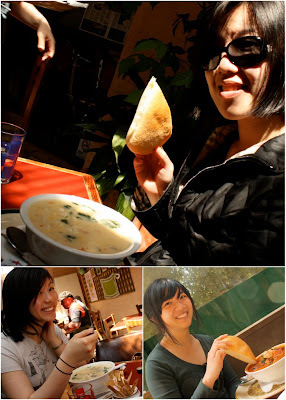 Chowder House - A place that specializes in chowder. Huge bowl. Woke up feeling really nauseous and had the chills. Decided to drag myself to work anyway and see how I would go. After cementing a crown, during which every time I turned from my bracket table to the patient I had lurches of nausea, I decided I had to cancel my patients for the rest of the day and pass out in bed. Which was what I did. Still not better - if I stay completely still it's okay, but if I move it's awful. 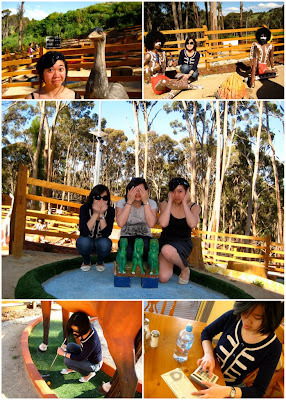 When we found out that there was an Australian themed mini golf course in Daylesford - it was clear we had to go. At the end of the 18 holes, my right arm was already vaguely sore. Yes, I am in dire need of a strict exercise regime. I'll be starting... soon... ish. Maybe. I know it looks like we didn't golf at all, but we did. At the end we calculated the scores and turns out I am indeed the lousiest golfer out of the 3 of us. Which doesn't come as a shock. Listening to Halo while packing for my Daylesford trip. 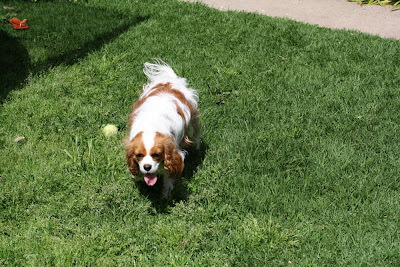 Which means I have to pack Milton off to the kennel as well. Not sure if I've mentioned it before, but I'm a really bad packer. I always forget a critical item... like... my glasses. Or a towel. Or something equally silly like that. Hoping to be very meticulous this time. Been getting addicted to some pretty random songs lately. Have been reviewing my wish list as of late as well. Have decided that maybe it is time to put my trusty 7 year old iBook to rest, even though it can still technically do the job. The new MacBooks have arrived and I'm tempted. Very very tempted. I've been expecting for a package for a while and it still hasn't arrived! 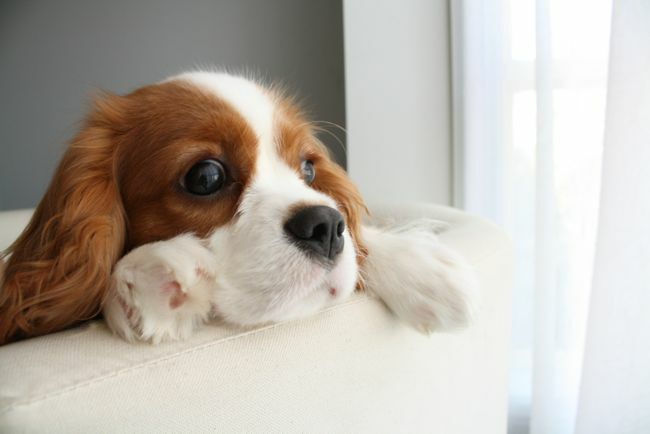 I'm waiting!!! 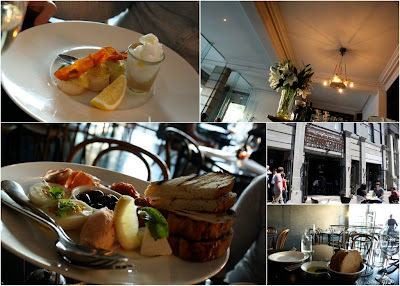 Going to Daylesford this weekend. Can't wait!!!! Milton's only friends have been human so far. Decided to bring him over to visit another dog to see how they would get along. 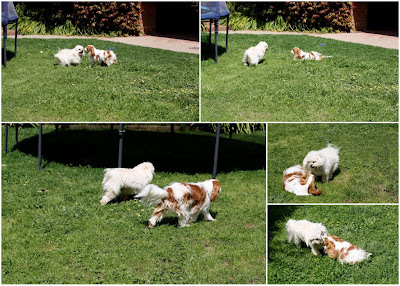 At first, Milo wasn't so excited about having another dog on his turf. But after he realized that Milton was friendly and easygoing, they got on really well. Here they are walking together like best friends and playing chase-me-sniff-me. Mommy, I'm exhausted! But I'm having sooo much fun!! 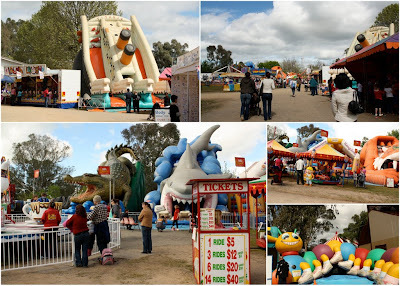 Went to the Benalla show this weekend. Here's me and a Kelpie puppy. For sale for only $25. Milton seems like a complete waste of money compared to this sheep herding working dog. Also experienced my first corn dog ever. General scene. Almost like a carnival. Sheep herding. Was very impressed by some of the dogs - one could see which had finesse and which didn't. Lots of other animals around too. 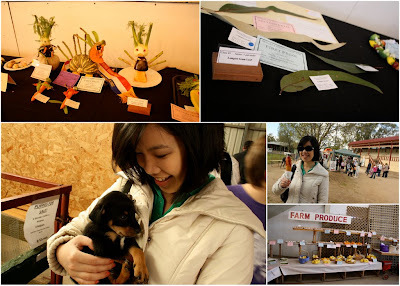 So that's what the Benalla show is all about. I dislike making cut cookies because of the amount of work involved. Making the batter, rolling, transferring the cookies, waiting for it to bake, making up the icing to go onto it, getting it just the right consistency, piping it on... so much work! However, managed to do all of that in 45 minutes!! 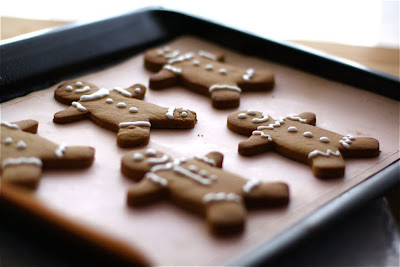 Here are my gingerbread men. Quite proud of them. 1. Melt butter, sugar and golden syrup together. Add flour and ground ginger and mix until it forms a dough. 2. Cut cookies out and bake in a 180 Celcius oven until slightly brown around the edges. In 2007 and 2008 I was in the excellent habit of writing down 3 things that I was grateful for each day. Then somehow I fell off the band wagon. Very annoyed that I let it slide to that point but oh well, what's done's done. Anyway, in order to attempt to at least do something with No. 51 of my 101 in 1001 list, I have decided to try to pick it up again. 1. I'm grateful for all the lemons that we have gotten for free from all the generous givers. They have been used in various recipes. 2. I'm grateful to the person who invented the triple-tray technique for taking crown and bridge impressions. Best. Idea. Ever. Saves. So. Much. Time. And. Effort. 3. I'm grateful for the people in my life - the ones who are there through thick and thin. Always nice to know you're loved. I've been playing a very new and dangerous game with my wardrobe called "Let's-Leave-Laundry-For-As-Long-As-Possible-And-See-How-Many-Outfits-I-Own-That-Is-Suitable-For-Work". No better way to wake up in the morning. 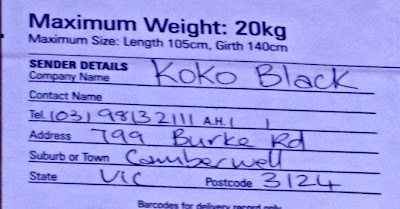 Most of you will know that I have a great love for Koko Black chocolate. I've tried out many chocolate stores in Melbourne and at the end of the day I still think that this is the best. 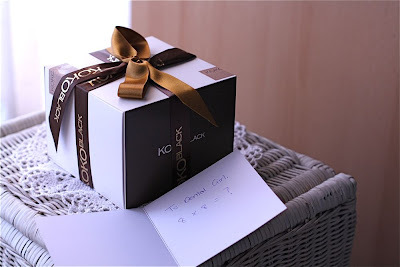 One of my dreams is to one day wake up, open my front door and find a 64 piece Koko Black box sitting there. For me. Then I grew up and realized the likelihood of that happening is rather low. Being a self-sufficient person I have bought chocolates for myself, but not a 64 box. 16, yes. 32, yes. But not 64. I guess a tiny part of me is still hoping that some day it will happen. Anyway, my housemate bought a box of 16 for me and my other housemate to share. 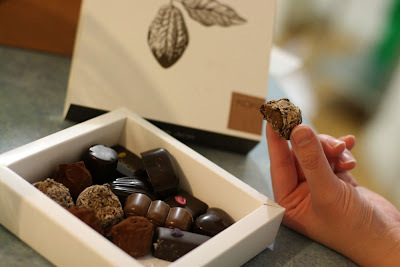 Love free chocolate - especially Koko Black chocolate. Yes, we do feel extremely lucky. 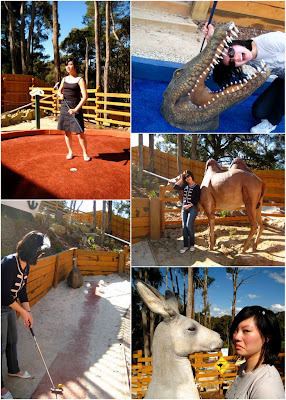 Went down for the day to visit my friend in Shepparton. She had promised me a fun-filled day. 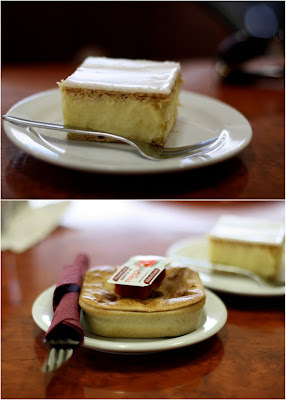 The first thing we did was to seek out the best vanilla slice in Victoria - or so they claim. 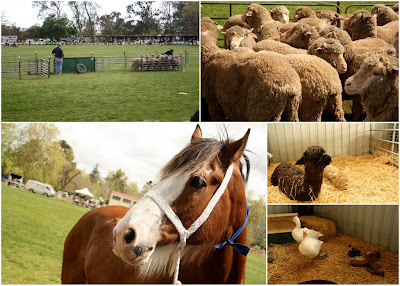 It's in the town of Tatura, about 15 minutes out of Shepparton. Vanilla slice and my steak and mushroom pie - Vanilla slice was good. Steak and mushroom pie nothing extraordinary. We then went to seek out chocolate coated toffee apples. 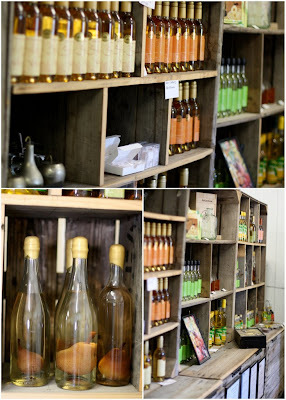 The store was quite interesting - particularly the pear in the bottle (picture bottom left). Turns out they pop baby pears into the bottle while they're still small enough to fit through the neck and then hang the bottle up with the pear until it's fully grown. 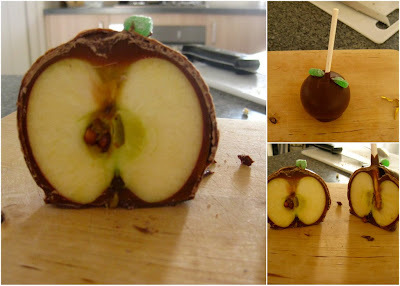 Anyway, here's the chocolate toffee apple. Very sticky - idea better than the actual thing. 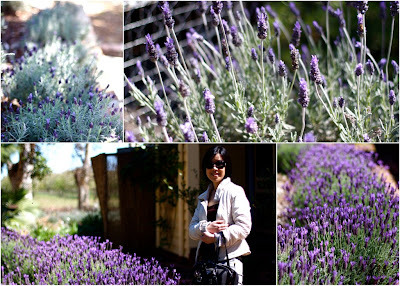 Also went to a lavender farm, which did not have much lavender. All in all, had a good day. Went shopping as well and bought my first dress in like... 2 years or something like that. Felt good. Then went home to drink white nectarine wine while watching The Proposal. Easy viewing, but very predictable. 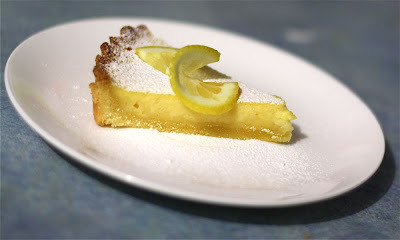 There's lots of lemons around the house still and I finally mustered up the energy to bake a lemon tart. Housemates have been expecting it for a while now but I kept putting it off. Well, they need not wait any longer. 1. 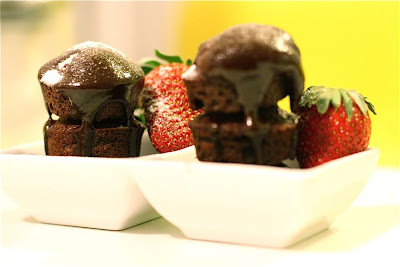 Process all pastry ingredients in a food processor until it comes together in a lump. Press into a 20cm tart tin. Leave in refrigerator for 15 minutes. Weigh down with pie weights and bake in oven for 10-15 minutes or until slightly golden at 180 Celcius. 2. Whisk together all ingredients for the lemon filling. Pour into baked tart shell. Bake in oven at 160 Celcius for 20-25 or until lemon filling is set. 3. 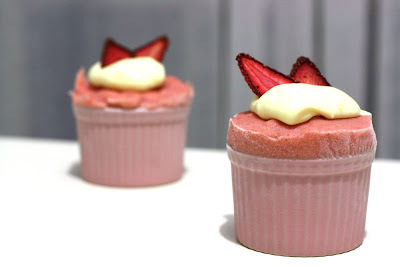 Unmold and dust with icing sugar. Decorate as desired. Gardeners have descended into our garden to get rid of our weeds. The truth is that our garden has been sadly neglected for the past 9 months and we've decided to hire gardeners to come get rid of the jungle that we call our garden. Very embarrassing. A possum escaped into our back yard and one of our neighbours came into our backyard to try to find it. Can you imagine? The shame! Anyway, it'll all be good... they're getting it done this very minute. This was done almost a month ago but I just have not had the spirit to put them up. 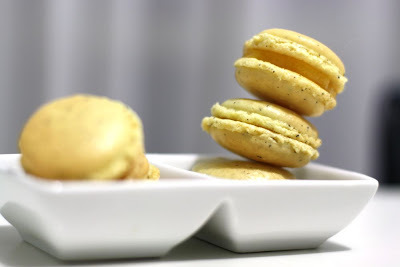 Lemon macarons and frozen strawberry souffles. I only have 1 wisdom tooth. And it had been happily sitting in its bony crypt for the past few years, not giving me and trouble. Just a couple of days ago I felt some tenderness behind my 17 and realized the awful truth - I could feel a swelling where the 18 is probably just hovering under the gum, trying to erupt. So here comes the irony. When a patient comes to me with this problem I write a OPG referral and a specialist referral to see an oral surgeon to get it out. And I warn them that if they leave it any longer and let it get worse and they're stuck on a ridiculously long waiting list things are not going to turn out well. Well. Here I am sitting around not wanting to write a referral for myself to see said oral surgeon. Been sleeping a lot all week. Something like 10-12 hours a day every day. Kinda wonder how I do that sometimes. 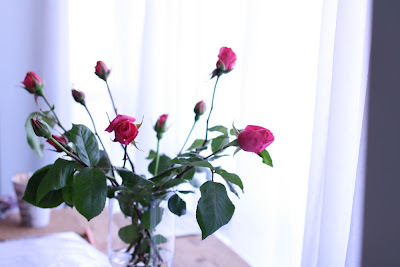 Been mulling over the idea of baking something all day but just am not in the mood - the house is too cold and all I want to do is cower under my doona and read in bed. Because yes - our heater has decided to conk out again. Doesn't help that excessive sleep leads to lots of fitfulness, which in turn creates really ridiculous dreams. Most of them have been too obvious to even need interpretation - I'm just recreating what I wish would happen in real life in my dreams. Then I wake up and am faced with the harsh reality that they were just what they were - dreams. But enough negative talk now. Should make something pretty to cheer myself up. Or something or other. 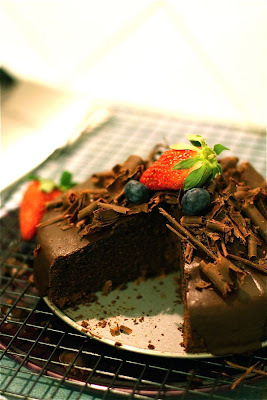 This is one of the best chocolate cake recipes I've ever tried out. Definitely a keeper - very moist and tender. Recipe from here. Made them in baby cake form as well as a big round one for amusement. So I've been putting off everything for the past 2 weeks. Laundry, paperwork, cleaning out my car, grocery shopping, everything. I guess I haven't really been in the mood for much. Been stuffing myself silly with double brie cheese and fig paste all day and night. And sweet chilli and sour cream chips. And chocolate. And more brie and fig. Doesn't help that the heating in the house isn't really working again. I'm always grumpy when I'm cold. So tomorrow I will have to go on a massive grocery shopping trip. My fridge has not looked so sad in a very long while. My housemates were wanting to know why I've suddenly tailed off from my frenzied cooking only about a month ago. The truth is, I'm tired. And all I want to do is sleep. Been sleeping 10 hours a day for the past few nights and it just doesn't seem to be enough. On the plus side, will be heading down to Melbourne this weekend for some food. That will be nice. You hear me? I hate this.